CHICAGO (AP) -The Nashville Predators might have improved their chances in the postseason by losing their regular-season finale. NHL rookie scoring leader Patrick Kane recorded his 20th goal and had an assist, and Patrick Lalime made 29 saves in the Chicago Blackhawks' 3-1 win over the Predators on Friday night. Rich Peverley scored for the Predators, who lost for the first time in regulation following a 5-0-1 stretch. Nashville, which clinched a playoff berth with a win over St. Louis the previous night, is locked into the eighth place in the Western Conference and a first-round matchup against league-leading Detroit in the opening postseason round. "Detroit's the best team in the league right now," Nashville goalie Chris Mason said. "Regardless of who you play, it's going to be tough. But we've played well against them. We'll have to be disciplined." The Predators were 3-3-2 against the Red Wings in the regular-season play. A win against Chicago would've given Nashville a chance to move up to seventh and drawing a first-round series against San Jose, which beat San Jose in the opening round the last two years and swept this season's series 4-0. "The most important part is getting in (to the playoffs)," Nashville coach Barry Trotz said. "It really doesn't matter in the playoffs who you play against. "Last night there was a sense of relief and a sense of exuberation. I knew our focus wouldn't be there tonight." Nashville, which has made the playoffs for four straight seasons, has never advanced past the first round. The Predators lost to the Red Wings, 4-2, in their initial playoff appearance in 2004. "Is it better to play Detroit than San Jose? I don't know," Nashville defenseman Ryan Suter said. "They're No. 1 for a reason. It's going to be a great series." 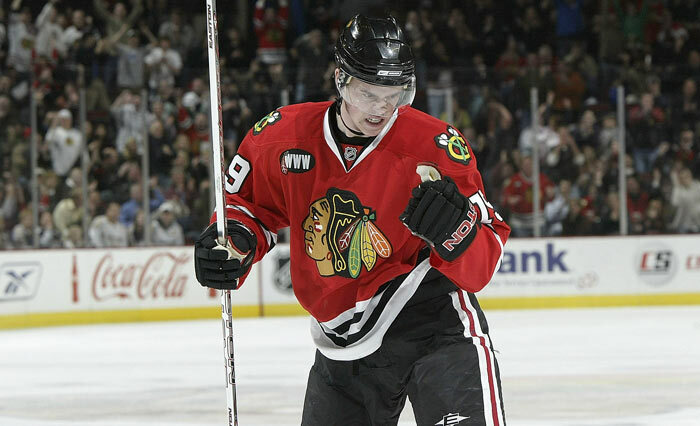 Rookies Jonathan Toews and Adam Burish also scored for Chicago, which won its fourth straight. The Blackhawks were eliminated from the playoffs for the ninth time in 10 seasons on Thursday night when Nashville defeated St. Louis. Still, Chicago has enjoyed a resurgent season. The Blackhawks improved to 40-33-8 with one game remaining. Last year, they were 31-42-9. On Friday, they finished their home schedule on an upbeat note before a cheering, season-high crowd of 21,929. "The most important thing was the last minute of the game," Chicago coach Denis Savard said. "The way the fans were acting was spectacular. "The impact Kane made to our season - he and Toews - to get us where we're at now, was great." Added Kane: "We were playing to prove something, I think. It's fun to get a win in front of a crowd, especially with almost 22,000 people here." Mason started in goal for Nashville and allowed three goals on 12 shots. He was replaced midway through the second period by Pekka Rinne, who made eight saves. Peverley opened the scoring 2:18 in, then the Blackhawks scored three straight goals and held a 3-1 lead after the first period. Toews tied it at 1 at 4:52, firing in a rebound from the slot for his 24th goal. Burish made it 2-1 at 7:11 with a short-handed goal that withstood a video review. Burish cut to the net and was knocked down by Nashville defenseman Ville Koistinen. After Burish and Koistinen collided with Mason, the puck slid over the goal line. Kane scored his 20th of the season at 11:09 on a deflection to make it 3-1. "You could probably tell we weren't into it in the first period," Mason said. "After that we came back." Lalime made several tough saves in the scoreless second and third periods. "The way Lalime played is the way he's played all year," Savard said. He's done his job. He was tremendous." Notes: The crowd was the Blackhawks 12th sellout of the season. 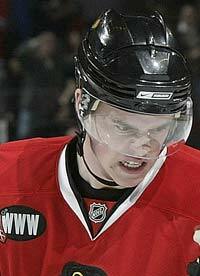 ... Chicago LW Ben Eager missed his 12th game with a shoulder injury. ... Nashville C David Legwand missed his 13th with a bone bruise in his foot. ... Four Nashville regulars were rested as healthy scratches - D Marek Zidlicky, D Greg de Vries, C Jason Arnott and G Dan Ellis. ... Chicago LW Adam Berti was recalled from Rockford of the AHL on Friday and played in his first NHL game.